Nicely done! 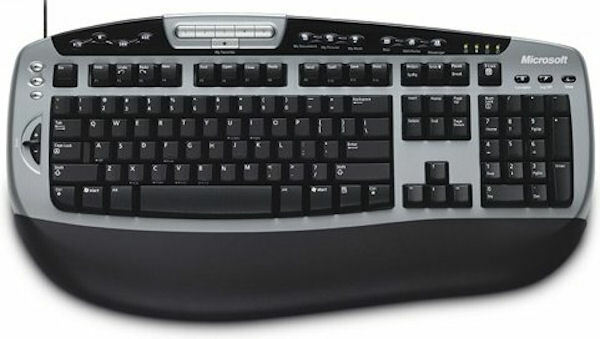 Its something many people overlook – the productivity, aesthetics and form factor of a keyboard. Not to mention the ergonomics of a keyboard. I too needed a keyboard for my newly born home office (aka living room) so went througha number of reviews and options. However I must admit despite going through a relatively similar procedure as you… I succumbed to http://www.apple.com/uk/keyboard/ for looks, being used to Mac Air and was only slightly put off by the lack of number pad. I went for pretty Apple and maintaining portability and feel compared to working direct from my Air, and although initially worry setting in, working across both feels very natural, one thing that I was worried about! Thanks Matt. I did consider the Apple keyboard, after it was recommended to me by a couple of people. I even tried out a colleague’s Apple keyboard. That was what immediately turned me on to trying the Logitech laptop-style keyboards. I bought a new mouse recently too. But that will be the topic of another post, I think. I was thinking to myself yesterday that I need to get a new keyboard, and I remembered that you had put this review together. I’ll pop into PC World and try out the K750 and see how I get on. It looks pretty good and I like the idea of dimpled keys! Thanks again for another great tech review!! Thanks Chris, I’m really enjoying the K750. It took me a week or so to get used to a full-sized keyboard again after trying the compact K360 for so long but I’m back to being able to type again without having to check where my fingers are going. I really like the low profile and that I don’t have to hammer down on the keys: very comfortable to type on, particularly for prolonged periods. There is a white, Mac version of the K750 too if you’d prefer that — I seem to recall that you have a Mac. I’m writing this reply on my new K750. I got so used to the MacBook keyboard that my old Windows PC keyboard was becoming VERY unfortable. This is so much better and I love it already!! I had the Microsoft Media Pro too. Lasted about 5 years and then the space bar started to go. I liked it, but liked my keyboard after that better, a Logitech Wave. The space bar went on that too. I’m a writer and type for hours a day, but am not a pounder. In other words, I type lightly. A month or so ago, I had a K750 on order from a place that didn’t have them in stock, and I ended up getting a mechanical and canceling that order. Then I bought a discounted refurbished K750 because I wanted wireless, more silent keyboard, especially for pressing keys while recording, so the mic doesn’t pick them up. The Razer mechanical with Cherry Blue switches, took me a week to get used to. I type 100 wpm so I was hoping to get a speed boost from it but got none, however, the tactile feeling is pleasing and the sound is kind of fun. That said, if I’d bought the K750 first, I never would have gotten the mechanical. I like the feel of the keys, the quiet sound, and minimal movement of the K750 switches along with the springy feel in the keys. Before I buy anything, I read dozens of reviews, and yours helped me made a decision for the K750 although the 1000+ reviews on Amazon were helpful too. So, thanks for the review, and is your K750 still working fine? I now have two Logitech K750 keyboards: one for home, one for work. I like having the same keyboard in both locations as it helps me move from one environment to the other without having to think about it too much. Also, the K750 has a really nice, low profile which has meant that I no longer get RSI in my wrists, which used to happened every few months when using the Microsoft Media Pro keyboard. I considered buying a mechanical keyboard, as I used to have one back in the days of Windows 3.1, but I settled on this one before trying one out. I was looking at Das Keyboard, if I recall. My approach was to buy 4 Media Pro keyboards when they were on clearance. I’m turning 40 this year so they may outlast me. But I expect at some point before that they’ll change the drivers or interface on whatever the PC has evolved to. Still doesn’t help me at work where I use what I’m given.